When it comes time to purchase a new bike, the broad array of options can be daunting. We’ve created this guide to help you sort through all the information and choose the best road bike for you. The main questions to ask yourself are, What type of riding am I doing now? Do I intend to take up a different kind of riding in the future? What’s my budget? Let’s start with the first question: What type of riding are you doing now? If you’re riding flat expanses, then a bike with aerodynamic features or additional comfort is most likely going to be a better investment than a super lightweight climbing bike. If you just need a solid commuter bike for work and maybe some recreational riding on the weekends, then you can afford to be thrifty and forgo the bells and whistles. And if you’re not a high-level cyclist but very enthusiastic about your riding and have the money to spend, you might go all out and get the bike of your dreams. Which Type of Road Bike Should I Buy? There are several kinds of road bikes that each cater to specific types of terrain and styles of riding. Aero bikes are built for one thing: speed. If you’re going to be racing, you want an aero bike. 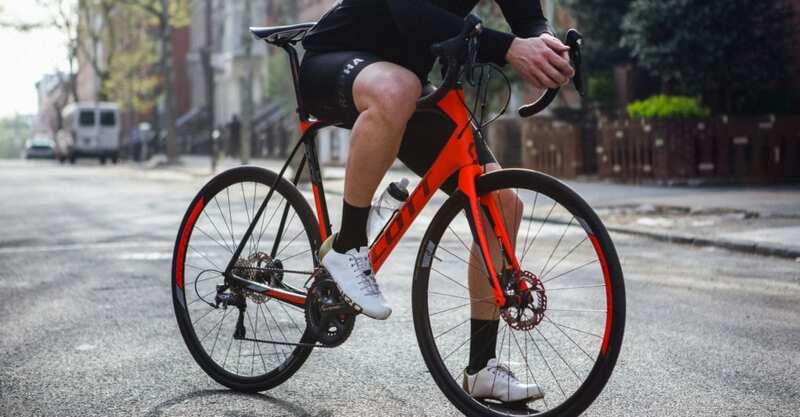 Endurance road bikes are fast becoming the most popular form of road bike, given that they provide a stable ride and a relatively high level of comfort. Touring bikes are a subset of endurance bikes, with some of the qualities of all-road bikes. Lightweiht bikes are the bike of choice for riders who enjoy seeking out some elevation. They are agile, high-performing machines that focus on keeping weight down above all else. They have featherlight frames and are designed to perform at their best when climbing mountains and attacking on the way back down. A newer development in cycling technology, all-road bikes allow the rider to access all types of terrain on one bike. They tend to be durable, comfortable, and equpped with various performance features. Recreational bikes don’t have any bells and whistles and focus on comfort and practicality. They are best suited to new riders who just want to be active and easily get from point A to point B. They are a great introduction to cycling and can be the perfect all-purpose machine for those who take their cycling casually. Another important consideration as you choose your road bike is the groupset. The groupset is comprised of brakes and the drivetrain, and is thought of as the bike’s engine. The drivetrain consists of the cranks, chainrings, chain, cassette, derailleurs and shifters. As you spend more money the efficiency, durability, and shifting performance increases while the weight decreases. The three primary groupset manufacurers are Shimano, Campagnolo, and SRAM. Shimano is the most widely used, SRAM is the lightest, and Campagnolo is the high-end choice. If you want to pedal efficiently and be “one” with your bike, you should use cycling shoes and clip-in (a.k.a. clipless) pedals. Not doing so is like fueling a high-performance sports car with low octane gas—it will still go, but will lack oomph. Talk to your local bike shop about the various brands and pricepoints available. It is crucial to get a bike that fits you. An incorrectly sized bike will cause discomfort and a negative riding experience (and even potential injuries), defeating the whole point of your purchase in the first place. However, if you are comfortable on the bike it will provide a more enjoyable experience and you will want to ride it more. Our best advice is to work with a local bike shop that has good reviews and experienced salesmen and technicians. We’ve also gathered resources on this topic and created a road bike sizing guide. If you get the wrong frame size, all the other little adjustments you can make won’t really solve the issue. On the other hand, if you do have the right frame size, but the adjustments aren’t unique to your body and riding preferences, you’ll be just as uncomfortable. A budget bike that fits you like a glove will feel much better than an ill-fitting superbike. While most brands have bike fit charts on their websites, it’s vital to just go sit on the thing if you are new to cycling. Once you learn your measurements, you can shop off of charts; in the meantime, don’t be afraid to try any bike that interests you. Budget is the biggest question and the biggest limiting factor when purchasing a road bike. The price range for a road bike is enormous, running from $300 for entry level recreational road bikes up to $10,000 and more for elite performance road bikes. Spending more money on a bike will typically result in lower weight, increased stiffness, improved shift quality, increased durability, and greater comfort. It’s important to know that once you’ve purchased a bike, the job isn’t over. Be sure to put some additional money aside for any of the following items, or try to get them included in the price of the bike. Bicycle Accessories: tire repair kit, spare tubes, seat bag, tire mini-pump, tire floor pump, chain lube, bike cleaning kit, cassette, bike multi-tool, water bottle cage, bike computer, and bike rack. Only by taking a bike for a ride will you get a feel for its characteristics, size, geometry, and intricacies (just like with a car), so always see if you can get a demo from a local shop to use over a weekend, or at least try to simulate the type of riding that you plan to do. With the help of a sales specialist, you should be able to narrow down your selection to 2 or 3 bikes. Even though they may have similar prices and components, they will feel different to ride. In most cases, one bike is just going to feel better for you than the others–go with that one. You want a bike to become a natural extension of your body. Shopping locally may come at a small premium, but you will most likely end up saving money compared to an online purchase as good bike shops know the bike and the brand and will work hard to make you happy and keep you as a customer. If you’d rather rent a bicycle and you’re in the New England area, check out out list of bicycle rentals.